Chattanooga's Downtown Post Office, after some lawsuits and numerous complaints over the years, is finally getting a handicap ramp. Federal Judge Sandy Mattice said the complaints had increased in recent months and the General Services Administration agreed to fund the project at the historic building on Georgia Avenue. The judge said, "It's a beautiful building, but it's old." He said he continues to urge the construction of a new Federal Courthouse in Chattanooga. The Joel W. Solomon Building currently serves both the federal courts on the left side and the Post Office on the right side. Judge Mattice said the new ramp is mainly for postal customers. He said there is limited handicapped access through a rear entrance to the court side. 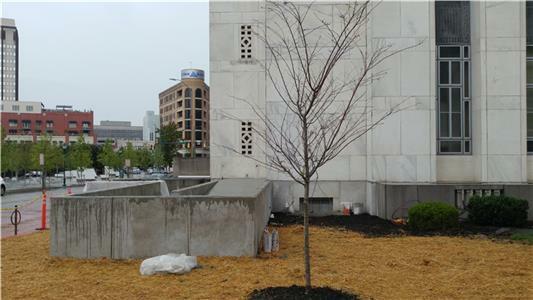 The project will remove a portion of the white marble on the south exterior wall by the front of the building to put in a doorway. The courthouse was the last major work of architect R.H. Hunt, a Chattanoogan who designed many of the city's finest edifices as well as many churches, business blocks and public buildings throughout the Southeast.